Believe it or not, I still occasionally have to explain the very idea of variant covers to customers that have been buying comics for years. …which amuses me mostly because of the effort extended in explaining the idea of “50/50 variant covers,” a once novel concept in which most retailers today are well-versed at best, entirely sickened by at worst. Anyway, here are both the covers of Boris the Bear in color, and if you haven’t yet, check them out…these are fun comics that are more than just parodies of then-current comic trends. One thing I’m wondering about is where they say they’re “sensitive to the problems created recently by other ‘two cover’ comics.” The only comic from that period that immediately comes to mind, probably because it’s the very comic being riffed on by those Boris the Beat covers, is Man of Steel #1. I don’t recall there being any particular issues with the dual covers on that comic, but then again, this was a couple of years before I started working in comics retail, so maybe I missed something. Far as I know they were equally available in comic shops, but maybe there was some kind of “order 1 of this one for every 2 of the other” deal goin’ on there, which admittedly would seem a bit out of place in the mid-1980s (but not so much in 21st century Marvel solicits). Wikipedia’s entry on variant comics specifically notes that Man of Steel #1 was the first comic marketed with two different covers, so maybe some confusion reigned at the time, with customers wondering which cover is the “real” cover. Or maybe retailers, new to the whole variant-ordering thing, ordered less of the “newsstand” cover versus the “direct sales” cover, causing a self-created shortage of the newsstand cover in the direct market. I’m not 100% certain, so if you can remind me of any other variant cover shenanigans of the time that might be the ones referred to in this letter, please let me know. Also, if you can think of simultaneously-released variants prior to Man of Steel , because I feel like there must have been something. Either that, or variant covers have been so much a part of our lives it’s hard to imagine they had a beginning. Just an endless parade of variants, infinite holograms and chromium enhancements and foil logos, looping through time from the beginning to the end and back again. well, there were the variant covers on Justice League and Firestorm where they tried a younger skewing trade dress, but never mind. Looking those up in the GCD, that experiment was about a year after this was published…so no, in my feeble memory, there was no other precedent. Boris was released in November and Man of Steel I’m 90+% sure was out late June/early July. How many other two cover comics could there have been? I’d think Boris could have been the SECOND comic with a variant. So I have no idea what “other” comics are being referred to unless the two versions of MoS #1 count as the “other”s. 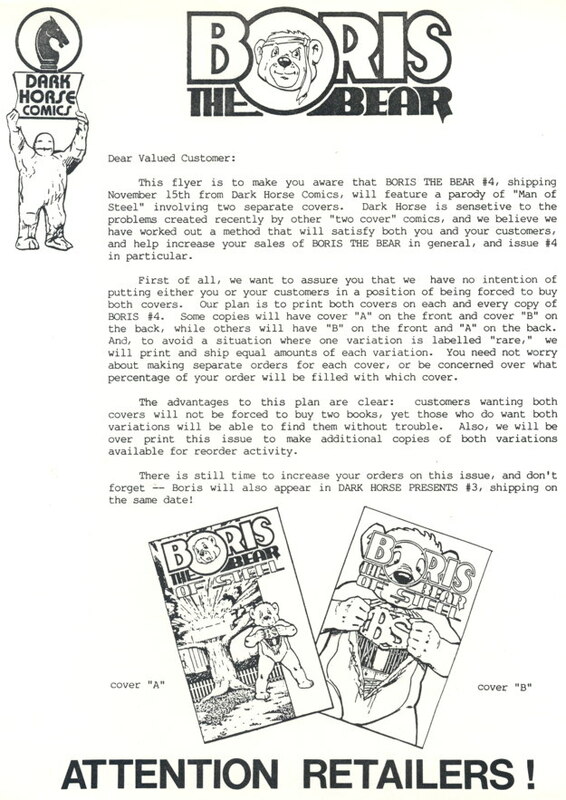 And the letter wasn’t really explaining the idea of 50/50 variants so much as the fact that every copy of Boris #4 was going to have both covers, just half of them reversed. Oh, man, I know it’s a typo, but I’d love to read a Boris the Beat comic — Boris in a beret, sucking on a coffin nail and snapping along over coffee as Allen Ginsberg reads “Howl” on stage at The Bitter End. But at the time if you wanted the newsstand cover all you would have had to do was wait two weeks and pick it up at the local 7-11. At the time they were readily available. And I always liked the newsstand cover better anyway. I’m thinking of Marvel, and how in either the lettercolumns or Bullpen Bulletins they had to reassure people that the cover differences between newsstand and direct market copies were only about the distribution method, and neither one was meant to be seen as rarer than the other or a variant of some kind. Maybe that’s what the flyer’s referring to. Also, I miss Boris. That was a fun series. You’ve gotta love Boris opening his shirt (Ew, no, it’s his fur!) to reveal a big BS. The book had an opinion on the practice, even as it was participating in it. Off topic, but remember when Concrete was a big enough draw that Dark Horse made him their standard bearer? Such a different time in comics. @Thom, as of about six years ago, their lobby still had the life-size Concrete statue greeting visitors. The mannequin done up as The Mask, meanwhile, has been moved from the warehouse’s display window to one of their Things From Another World stores here in Portland. @Andrew: Whoa. That is commitment. I guess if you pay for a life-size Concrete statue, you don’t want to just throw it out. And Wikipedia tells me Dark Horse was still printing Concrete comics as of 5 years ago, so I guess it’s more current than I give it credit for.